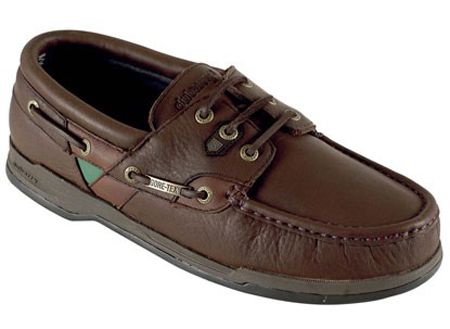 The Helmsman is Dubarry's top of the range GORE-TEX lined shoe. It is made from incredibly soft luxury-feel waterproof leather. The three-eye tie moccasin is designed for on foot comfort as well as its exceptional NonSlip-NonMarking grip. The Helmsman is a light weight and comfortable shoe, which makes it ideal for agility purposes when worn on and off the water. The Helmsman features: An adjustable round the shoe lacing system with an impressive 30kg breaking strain that offers extra security. The heel area also features extra cushioning with an EVA heel cup. The embossed leather insock, padded top collar and tongue all contribute to the comfortable feel of this high technology shoe.